The question is, does my 3 month old child need a $93 sweater made out of (hypoallergenic) baby alpaca wool hand knit in Bolivia by “a self-managed community of indigenous women, enabling them to afford proper health care and schooling for their children”? The answer: No. What are your thoughts? Le sigh. Le purr. Le cashmerrrrrrre for babies. Now, I can understand the obvious connection between babies ‘N cashmere: babies are wonderful and soft and precious and expensive; cashmere is wonderful and soft and precious and expensive. But, I cannot with babies IN cashmere; these little guys are messy. If they are lucky, 9 out of 10 babies will be begrudgingly stuffed into one of these tangerine stripped cashmere sweatshirts or a heather grey onesie with a heart/pirate insignia and immediately spew whatever they can all over it, in every impossible direction. Babies want to be naked anyway, and they don’t understand that this confection wrapped around them cost $178, plus tax and shipping. Admittedly, I am all for spending a significant price on clothing if need be, i.e. I have said to myself that I will wear these fancy dark wash, straight leg jeans for one year, so I will spend the $129. But best laid plans something something dark side, because my $129 jeans, purchased oh a few months ago, just ripped a gaping hole in the crotch on my way to work today. The diligent sew job with the Walgreen’s sewing kit at $4.99 only angered the hole, which reasserted itself more aggressively throughout the day, until I had to then feverishly seek out the nearest Gap for less-than-fancy dark wash, straight leg jeans on sale for $53. They are mom jeans. 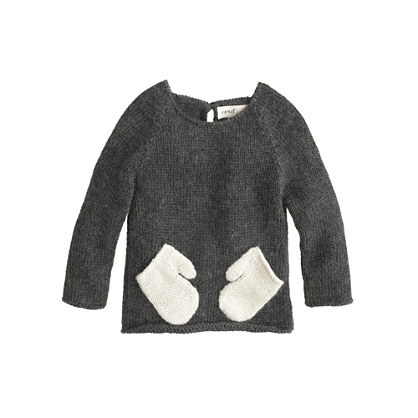 For all that extra spending, I could have just gotten my darling baby niece a darling baby cashmere sweater for a quick snapshot before all the spewing. So, in about face conclusion, “sure” to baby cashmere, and “absolutely” to sweatpants.